Get a head start on Earth Month with the Emory Earth Festival on March 27. 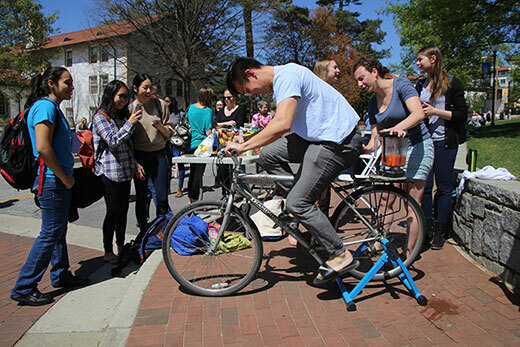 Take a spin with the bike-powered blender, play games and learn about sustainability-related Emory departments, student groups and community organizations. Celebrate the beauty of art and science and even a combination of the two during the event-packed month of March. Many activities are free or under $10 and you can choose indoor or outdoor events. 1. Take a hike, outdoors or indoors. Just in time for the Move More Challenge, beginning Wednesday, March 7, at noon, an eight-week walking group will meet every Wednesday through April 25. Walk independently or with a group; fun activities and themes are promised. You can choose the indoor option with walks in the Emory University Hospital Tunnel or the outdoor option of walking in Lullwater Preserve. Choose any or all Wednesdays to walk. This exercise is free. 2. Celebrate the rich connections between Eastern traditions and American poetry. Come to the Jones Room in the Woodruff Library on March 7 at 6:30 p.m. to hear Emory faculty reading Buddhist poems in their original languages, including Japanese, Marathi, Sanskrit, Pali and Chinese. Students will then read Beat poetry in English responding to the Buddhist tradition. A reception will follow. The event, “This Tank Full of Dreams: Buddhism, Poetry, and the Beats, is free and open to the public. 3. View some “Scandal”-ously pleasurable TV. Emory Cinemathetique's “Black Lives on the Small Screen” film series features two episodes of the very popular series on Wednesday, March 7, at 7:30 p.m., followed by a discussion with professor Kristen Warner of the University of Alabama. See Season 1, Episode 1 "Sweet Baby" and Season 3, Episode 8 "Vermont is for Lovers, Too." The screenings take place in Room 208 of White Hall and are free and open to the public. 4. Get a grip on the impact of the new tax reform law. Tax Day looms and though it won’t kick in until next year, the new tax reform law will change how taxes are done. Emory alumnus Jodan Ledford will talk about the impact of tax reform, particularly as it will affect employee benefits. Ledford will speak on “Tax Reform and Its Impact” on Thursday, March 8, at 7:30 p.m. in Williams Hall at Oxford College. 5. Strategize for some self-care via a convenient webinar format. Caregiver Wellness: Take Time for Nutrition offers information on how to prioritize your physical health, which may take a back seat to demands of caring for older loved ones and/or children. Participants will learn strategies for nutritional self-care, such as tips for grocery shopping, meal planning and eating healthy on the go. The information is useful for anyone looking to improve their nutrition. The link for this webinar will be sent out to registrants the day before. The webinar is Wednesday, March 21, at noon; register by March 20. 6. Learn about the magic of cats and dogs. The popular “Divine Felines” exhibition at the Michael C. Carlos Museum has inspired a lecture titled “The Magic of Cats and Dogs.” Learn from exhibition curator Melinda Hartwig about why they were so revered in ancient Egypt, their roles in religion and society and why the Egyptians considered them magical. The talk is Wednesday, March 21, at 7:30 p.m. in Ackerman Hall of the Carlos Museum. 7. Experiment at the Atlanta Science Festival. A number of the events will be held on Emory’s campus, and many are free but filling up fast, so sign up soon. Explore the scientific world through visual arts through the Science.Art.Wonder program on Friday, March 23. Meet artists and scientists on this walking tour exhibit on the Quadrangle from 3:30 p.m. to 7 p.m. There will also be hands-on art and science activities. It’s free and no registration is required. You can then head over to the Atwood Chemistry Center, where Emory’s cutting-edge research is translated into carnival games like Peptide Jenga and Bacterial Telepathy, complete with prizes. Plus, scientists will be on-site to explain the laboratory research hiding behind each fun game concept. Chemistry Carnival runs simultaneously with Science.Art.Wonder and is also free. And on the same day and time, the ever-popular “Physics Live!” will again feature giant soap bubbles and liquid nitrogen ice cream, among other treats, in the Math and Science Center. 8. Enjoy an evening of beautiful music. Hear the Vega String Quartet perform quartets by Beethoven, Mendelssohn and the world premiere of Richard Prior’s Quartet No. 3. Prior holds the Edward Goodwin Scruggs Conducting Chair and is conductor of the Emory Symphony Orchestra and Emory Youth Symphony Orchestra. The free concert by Emory’s international award-winning string quartet in residence will be Saturday, March 24, at 8 p.m. in Emerson Concert Hall, Schwartz Center for Performing Arts. 9. Fill your head with ideas, then your stomach with really good food. The Emory University Earth Festival kicks off Earth Month (in April) with a showcase of sustainability-related student groups, Emory departments and Atlanta organizations. It’s in Asbury Circle on Tuesday, March 27, from 11:30 a.m. to 2 p.m. and it’s free. There will be interactive activities including the smoothie-blender bike and a spinning wheel for games. The Office of Sustainability Initiatives is hosting a raffle for festival patrons who visit a certain number of tables with succulent plants as prizes, and a public recycled-art display and photo booth are also expected. Afterward, head over to the Emory Farmers Market, where with a little — make that a lot of — restraint, you can keep it to under $10. 10. Create a mandala sand painting. The final day of Tibet Week, Saturday, March 31, features the symbolic, ritual “withdrawing” of the mandala sand painting. From noon to 2 p.m., the public is invited to come to the Michael C. Carlos Museum’s Ackerman Hall and take the opportunity to use Tibetan chak-purs and brightly colored sand to create their own sand paintings. It’s free for Carlos members, $10 for nonmember adults, $8 for children ages 6 to 16, and free for children 5 and under; admission to the galleries is included.